The shot of warm sake precariously perched on two chopsticks is lying across the rim of a pint glass. Below, a golden beer fizzes in anticipation. Cue ritual chant, which builds in frequency and volume, culminating in two fists slamming down on the table, jostling the chopsticks. Detonation. The shot glass sinks to the bottom of the pint glass, delivering its payload of warm rice liquor. The newly formed sake-beer cocktail is then greedily and gratefully guzzled. This drinking game, said to be invented in World War II by American soldiers, is a ritual signifying adulthood, or at least the very early beginnings of it. 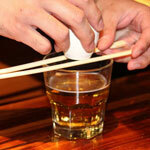 College students have carried on this tradition, spilling beer and sake in sports bars and Benihanas everywhere. And it’s up there with the most exciting bomb shots around. The “Boilermaker” and “Irish Car Bomb” require a careful drop of the shot in the glass. Here, there’s poetry in the violent collision of sake and beer. You can thank the flying chopsticks and chanting for that, as well as the force of the union. To commit this rite of passage to the memory of future generations, I enlisted the help of Wolfgang, a waiter at Wokcano downtown, and Cari Hah, a bartender at Cole’s nearby, to demonstrate the steps. Obviously this isn’t something you do alone but rather the bigger the group of friends, the better. Wokcano uses Sapporo beer and their premium hot sake for their sake bombs. Step 1: Set the glass of beer on the table, but not too close to the edge. Lay the chopsticks across the top of the glass. Then set the shot glass of sake on the chopsticks. Step 2: Stand before the armed Sake Bomb with fists at the ready, preparing to slam them down near the glass. Step 4: Slam your fists down on the table in front of the glass so that it jolts the chopsticks causing the shot glass to drop into the beer. But don’t slam too hard as you don’t want to upset the glass of beer. Just enough to topple the shot glass. Make sure to mind the blast radius. Step 5: Guzzle down the sake-beer cocktail. Yes, even with the shot glass still in the glass.